I will miss it when Spinner won’t go to sleep because he’s too busy looking for the moon and wanting it to say goodnight to him. I will miss it when Knittykid no longer follows me from room to room, trying to fall asleep wherever I might be. I will miss it when Math Boy finally decides he’s too old to fall asleep holding his mama’s hand. I will miss it when I come downstairs late at night and the floor is clean and the dishes have been done and it is quiet, and tidy and a good evening for knitting. I will miss this crazy, hectic, loud and messy life. 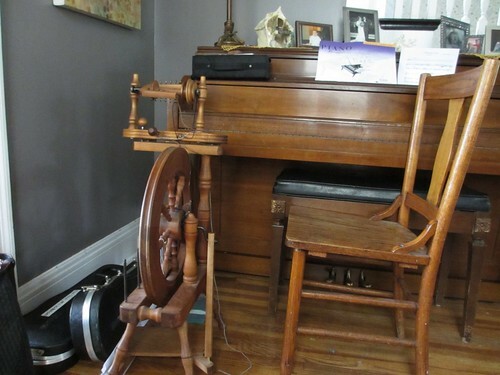 And I’ll have plenty of time to knit then….. 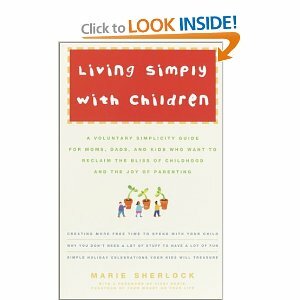 This book, Living Simply with Children by Marie Sherlock found it’s way home with me from the library. I’ve only paged through it so far but I’m excited by what she has to share. The first part of the book is all about the “whys” and the second about the “hows.” I’m especially looking forward to the “hows” since that is the hardest part. I’ll share more once I’ve read it cover to cover. The not so simple is the fact that we are now back in our house (yay!) after two weeks of living in a hotel while the plasterers/painters did their jobs. The house looks wonderful, but now I’ve got to unpack everything. It’s actually great timing to do this since it fits right in with our plans to simplify in regards to our stuff. I’m planning on being very mindful about what I unpack to keep and what I unpack to get rid of. I’ve focused so much of the boys stuff and I feel for now we have a pretty decent handle on it. Time to take a break and get a handle on my stuff. That’s the not so simple part. 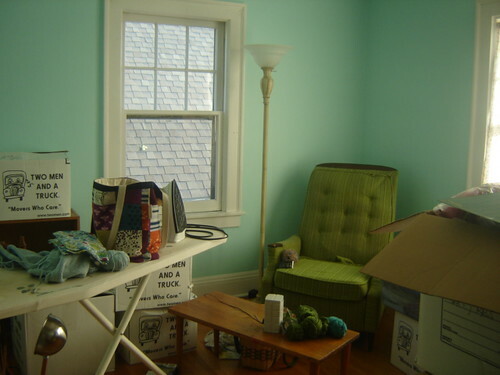 Although my studio is now that beautiful shade of aqua I’ve been pining for…. 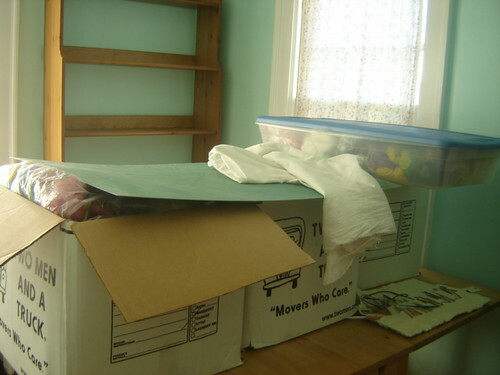 I have boxes upon boxes of fabric, books, magazines, and fiber. And guess where I shoved everything that didn’t fit in a box? Scary, I know. And remember, there is also a wall of yarn behind all that stuff. Yikes. So the question is, it’s easy for me to let go of my kids junk, or the Skeptic’s t-shirts (enter the contest yet?). But my stuff? I love it all yet it’s stifling at the same time. I need the room to work and this summer I’ve really felt my creativity being stifled. There is a lot of sorting, planning, a lot of mapping out but very little follow through and not much doing. I used to think I could never have too much yarn, fiber and fabric but it seems as if it’s time to whittle it down. Might be time for a stash sale and time to be a bit more realistic on what I want and what I need. Stuff. It’s the first thing most people think of when they think of simplifying. While that’s not the only thing, I do think it’s a great place to start. 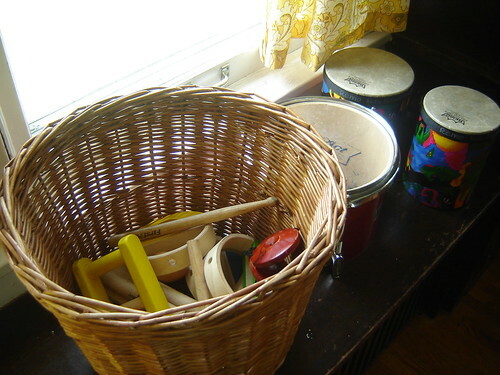 It’s hard to have a clear mind and find that sense of rhythm when you’re surrounded by clutter. In order to find calmness, you need some space to think, some room to breathe…..
Don’t try to do too much at once. Honestly, I thought I would get through all the toys and books in the house, sorted, organized and donated in a week or so. That was in June. I’m still working on it. Pick a category and work with it for awhile. Books? Toys? Clothing? Your own knitting/sewing supplies? Maybe you want to start with something big. Maybe you just want to get through a quicker category so you feel like you’ve made some headway. Either way, pick an area and stick to it. Ignore the rest until you’re done. Work in stages and don’t just get rid of a ton of stuff right away unless that’s what you really want to do. I have a hard time time giving things away as I get too sentimental. 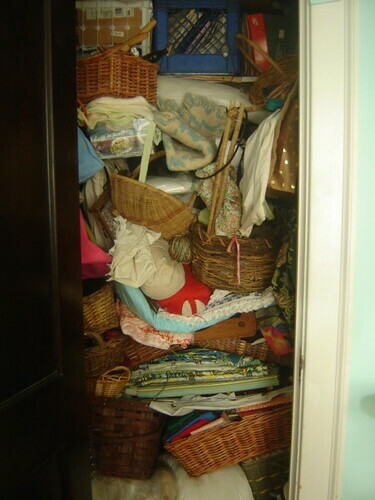 So in my case, I divided things into three categories: definitely get rid of, pack away for now, and keep. This cleared out a lot of the immediate clutter and has given me time to sort through the middle stuff, asking myself more questions to decide what I should keep. Choose the high quality stuff. Go for the well written books, the toys that spark imagination and thought. If it does nothing but beep,you might want to say goodbye to it. Ask yourself “How and with what do my children play?” “What do we love the most?” Really take the time to consider what you and your children actually use and enjoy. We had a beautiful wooden ball roller that I loved, but the boys only used it as a step ladder and threw the (very hard!) wooden balls around the house. So as much as I loved that toy, I found a mama with a baby just the right age to sit there and play with it rather than use it to possibly break a window. Consider how many items in each category you really need. After counting, I realized that Spinner had nearly 30 pairs of shorts that fit him. 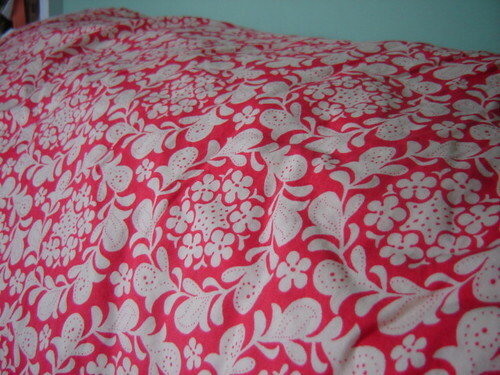 (I took in way too many hand-me-downs). I decided that ten was plenty and found a new home for the rest. And now I can actually close his dresser drawer. Put things into rotation. You’ll see in the pictures that I actually don’t have much out. 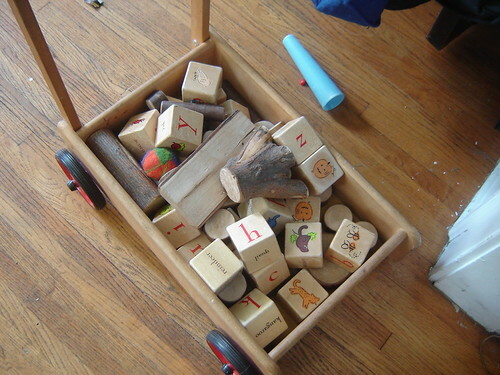 I’ve gotten rid of about a third of the toys we had, mostly things that were outgrown. Another third are in storage downstairs and the rest around the house. 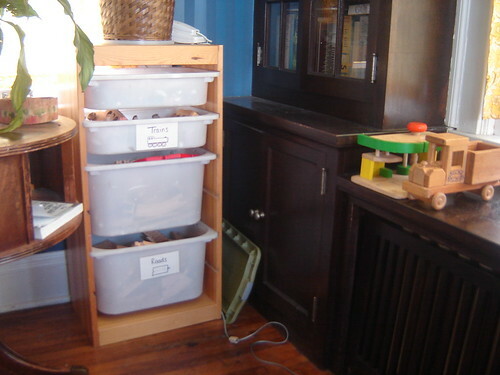 As I get the storage toys better organized, I’ll rotate things in and out. 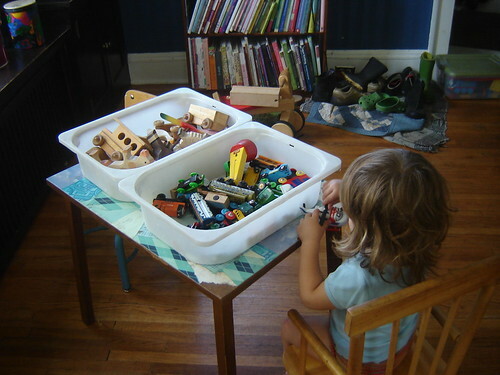 It keeps the clutter down, makes the pick up easier, and it means I can always find something new and interesting for them when I need it. If you can make some money, great, but don’t spend all your time trying to sell everything. You can spend a lot of time taking pictures, posting ads and responding to e-mails. It’s great when you can sell some stuff but just donating it is a lot faster. Lastly, go easy on yourself. This is not easy to do and I figure it will be a good year until I’m in the place where I want to be. Take your time and try not to stress it. This is supposed to make life easier, not give you a headache. So where am I at after two months of this? The living room now sports a simplified bookshelf, with just enough books for browsing but not so many that they just throw them all over the place. 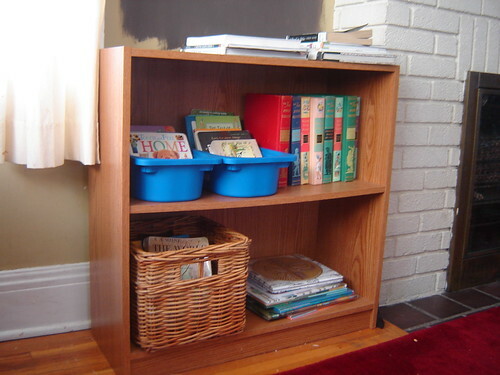 More books are in their bedroom, but the majority of them are downstairs. I’m trying to switch them out as soon as I notice they are tiring of these. There is also a special stack for our weekly library trips. 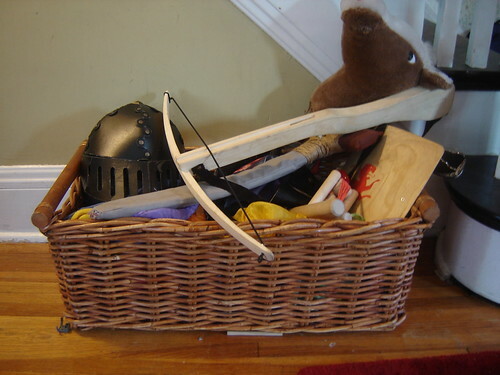 All the excess stuff was cleared out so that the dress-up basket is just for dress-up. No more random dinosaurs or trains hiding in here. Playsilks, armor and capes….this stuff gets used all the time. In the sunroom we have…. and fort making supplies. 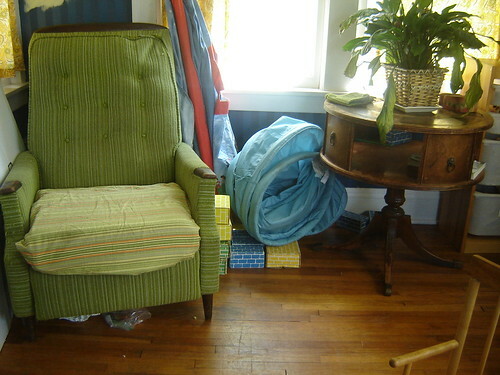 (The cardboard blocks hide behind the chair). 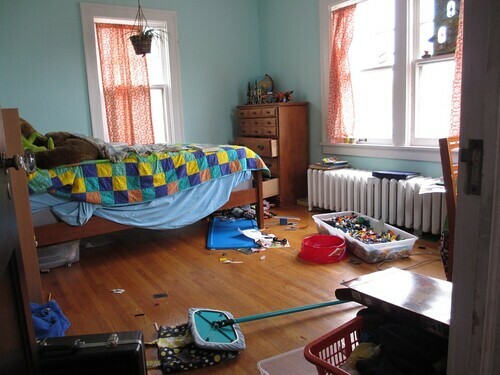 Overall, cleanup is much easier. The kids know aren’t so overwhelmed anymore, and they actually play with their toys rather than just throwing them all around. 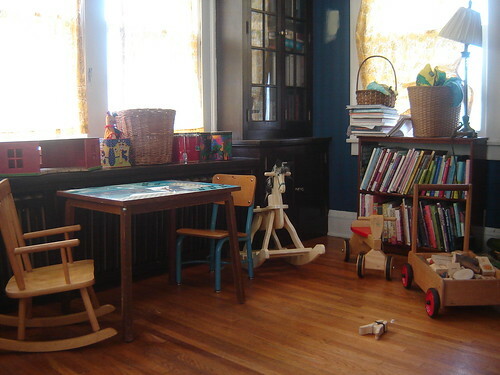 It feels like a nice playroom now rather than a room full of junk. 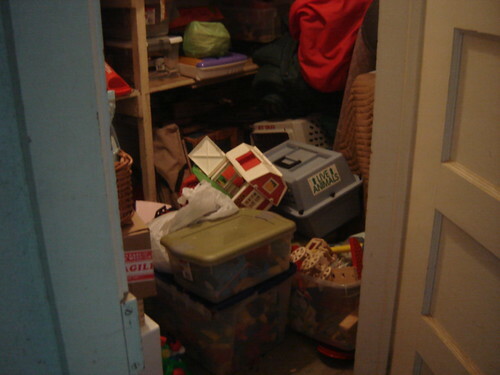 Lastly, to be a realist I do need to show the basement closet, which still needs to be dealt with. 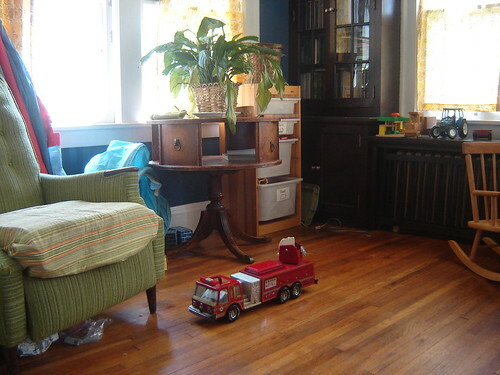 Here hide the other toys, the toys that were scattered in random pieces all over the house. This is the stuff I need to sort through next, organizing it so it can easily be brought upstairs and used or realizing that it’s just not something the kids play with and finding it a new home. So yeah, more work to do but I feel as if I’ve finally taken some control back in the house. Now if only I could keep those legos in the boys room from migrating throughout the entire house life would be good! Next up in my Simple series I’ll share my attempt at simplifying MY own stuff, yarn included! So I know I promised the first post in my Simple series, but today was one of those days, which means the photos I wanted to take weren’t taken. Poor Spinner was having a rough morning and was only happy when seated next to me reading books. The alternative was to let him follow me around, screaming “read” at full volume while trying to bite my leg. He is the king tantrum thrower of all three boys and I’ve learned over the years that when your toddler is in such a mood it’s best to just cuddle up. So Simple will follow, but I still have a bit of a preface to it by joining up with the Summer Studio Tour over at Beauty That Moves. (I’m a bit late but couldn’t resist). There is a neglected (and nearly finished!) 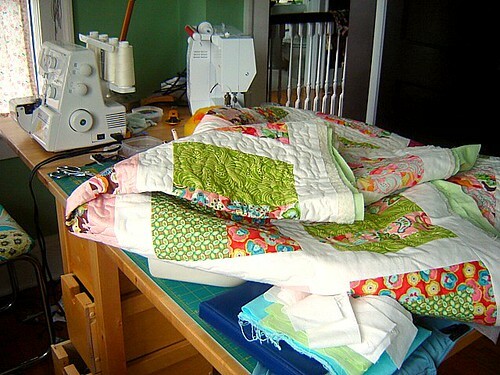 quilt sadly lounging on the table, but the real work in this room is the studio itself. 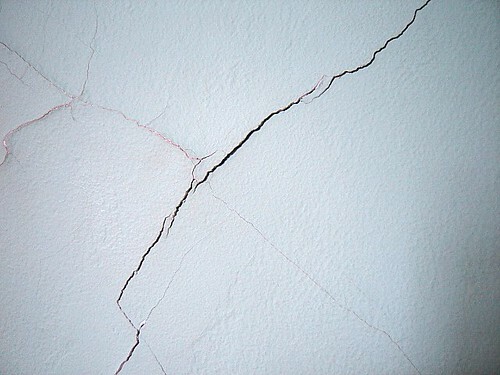 See the cracks? This is what happens when your house get’s a nice shove by a tornado. We’ve let the place settle over the winter and in a few weeks we will be visited by the plasterers/painters who will be giving our place a makeover. Studio included. Any guesses on the paint color I’m going with? No more green, that’s for certain. I have big plans for this room. Simplification is not just about the kids, it’s about making my life better as well. I often feel lately when I go into this room that I can’t get any work done because there is too much stuff all over the place. 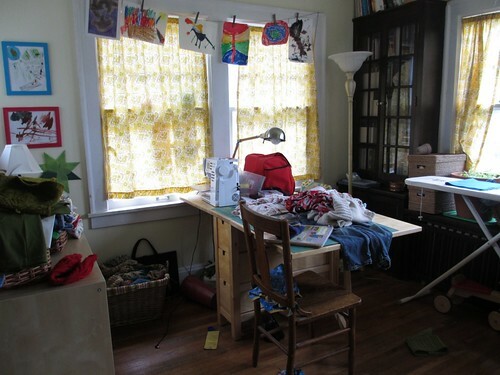 My sewing table is usually a mess, the ironing board covered with fabric, baskets of yarn and fiber everywhere, as well as whatever junk the boys dragged in. So I’ll be rearranging, adding more shelves and figuring out what I can let go of…the toughest part. 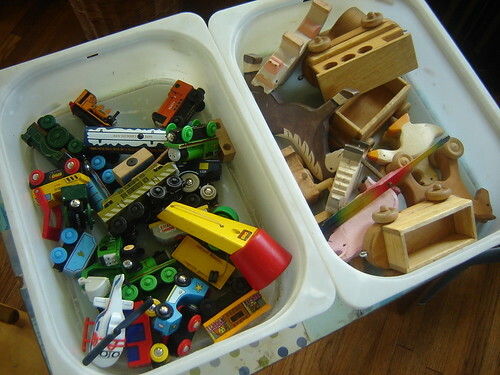 It’s easy for me to get rid of toys, not so easy for me to get rid of MY stuff. So we’ll see where it goes with this room. My hope is that I’ll be able to just come in and work, rather than spend half my time moving around clutter and feeling overwhelmed by project ideas. Hopefully tomorrow will be a smoother day and I can get back to the post I promised! Oh dear. I really wish I was going to show you pictures of my latest handspun. Or maybe the quilt top I am so close to having put together. Or perhaps the cute little knitting kits I have waiting for me in the closet, yarn and patterns all ready to go. (Don’t worry, that will all be appearing again, just not today). Instead, I am here to talk a about the search for balance. And why I’ll be taking a little break. 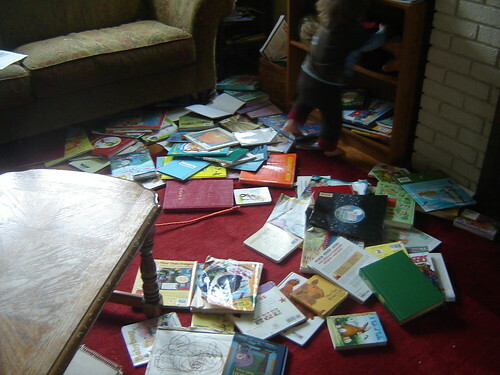 You see here approximately one third of the boys books strewn across the living room floor. And yes, you also see one boy on the bookshelf and one trying to join him. And of course a fight did ensue, as well as much wailing about the picking up of the books. All while I was trying to make supper. Now, if you take the above example and multiply it by, oh, let’s just say 10 or 20 a day and you can see how I’m feeling just a wee bit overwhelmed these days. Add the fact that the kitchen is ripped up (remodeling, good! ), we have to have the whole house cleaned out and ready for re-plastering in a little over a month (last of the tornado repairs) and the fact that Little Man Math Boy is on an elimination diet of no wheat, soy, dairy, eggs, nuts or fish, which leaves me cooking constantly and well, that makes me feeling really overwhelmed. But wait! It’s not all doom and gloom here. Life is a challenge right now, but I also know that these early, crazy years are but a blip on the radar. The boys will learn to fold their own pants, wash their own hair, find their own shoes and stay asleep once they go to bed. They will learn how to make their own lunches and do the dishes. They will learn how to not break down into a sobbing mess every five minutes when they are tired. I know this is going to get easier. But I also think I that even though life will be busy, and messy and shall I just say… energetic, I don’t think it needs to be as crazy and chaotic as it feels right now. The basic question is this: what if there were only ten books on that shelf rather than the sixty plus books I picked up? Now apply that question to every other nook and cranny of my life, and you’ll see where I’m headed. Because I realized that the stress in my life, the craziness, the lack of time and energy is pretty much caused by the large amount of stuff, stuff and more stuff. I want the focus in this house to be on our family and not trying to trudge through and clean up the stuff that’s all over this house. It’s time for the stuff to get cleaned out. So I’m taking the next month or so to get started on this new journey of ours. I’m going to follow the ideas lined out in Simplicity Parenting, and use the other links/books as further inspiration. I know I’ll just be making a dent in what I want to do this month, but the break from the blog will be one less thing for me to worry about as I get started. I’ll try to take lots of photos, and my plan is to return in late June and do a five week series on what I’ve been working on and some ways that you can do the same in your life. 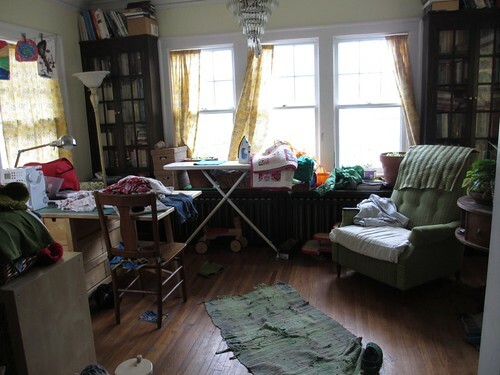 My hope is that as the stuff leaves, we will find more time in our house for each other as well as for the things we really want to be doing, rather than the daily drudgery of wading through the stuff. In the meantime, take some time to read the above books or visit the sites. Let me know, what do you do to bring more calm into your life? How do you make sure you have time for the people and things that are really important? This isn’t just for frazzled mamas like myself either. I think we all can benefit from looking at life this way. Wish me luck! I’ll see you in June….